I can't remember how I first discovered the writing of Laura McBride—whether I happened upon the beautiful cover of her debut novel, We are Called to Rise, while I was snooping around the bookternet or whether I heard about it on one of the many literary podcasts I listen to obsessively— but I am so thankful this book crossed my path. I read it over a year ago, but I still clearly remember reading the last sentence while I walked on the treadmill and wiping tears from my eyes with my t-shirt. The characters are beautifully drawn and palpably human, and the ways their lives intersect are heartbreaking and hard to forget. When I closed that book, I couldn't wait to recommend the book to everyone and I promptly gave it 5 enthusiastic starts on Goodreads. When I learned she had published her second novel, 'Round Midnight, I bought it right away. I devoured this book much like I did the first, and I was left with the same feeling of satisfaction mixed with a twinge of sadness, as I read the last pages and had to say goodbye to the wonderful characters. Both books tell several stories from multiple viewpoints, and in each book, Las Vegas is one of the main characters. 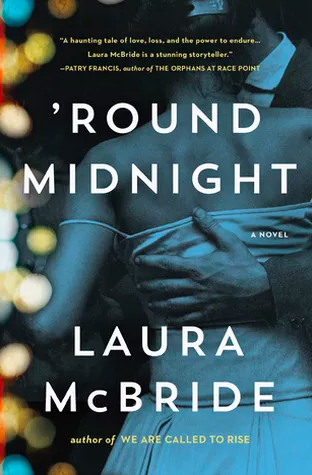 Her first novel takes place in current day Vegas while 'Round Midnight is historical, telling the story of four women in Vegas from the 1960s to 2010. This story centers around a particular lounge in one of the old casinos and the ways the characters' lives intersect and are irrevocably changed by the events taking place in that room. A resident of Las Vegas, McBride clearly has a love for this much maligned city and has seen first hand the way it has changed so rapidly over the course of a few decades. Her descriptions of the the city are evocative and gorgeously accurate. "how to keep up in a town that raced and bucked and reared and roared, ever forward, ever faster. You had better be ready for the ride, because Vegas wasn't for the weak and it wasn't for the cowardly; if you really wanted to win, you had better take off your hat, wave it to the crowd, and smile like an idiot. You had to make it look fun." "Lights twinkled, glowed, flashed, there were machine sounds of dings and whistles and whirs, coins clanking in trays, voices calling numbers, people talking, the whish of air moving: cacophonous, psychedelic, disorienting, galvanizing." McBride does an incredible job writing about diverse characters who are unlike her. The four women in this book are Jewish, African-American, Filipino, and Mexican, and each feels equally real and believable. Piecing together who these women are and how their decisions affect the others in special and unexpected ways is one of the many joys of this book, so I won't give away too much of the plot. Suffice it to say that McBride is a gifted writer and a creator of unforgettable characters, and I rooted for each and every one right up to the final unforgettable sentence.